In October 2012, British citizens Babar Ahmad and Talha Ahsan lost their battle against extradition to the US. They have since been held in pre-trial solitary confinement at a “supermax” prison. What is solitary confinement, and why do so many consider it to be torture? On 5 October 2012, British citizens Babar Ahmad and Talha Ahsan lost their battle against extradition to the US on charges of alleged web-related support for insurgents in Chechnya and Afghanistan during the 1990s. Their arguments rested on claims that pre-trial and possible post-trial imprisonment in the US would be tantamount to cruel and degrading treatment. Appearing before a Connecticut court on 6 October, both men denied all charges against them. They have since been held in pre-trial solitary confinement at the Northern Correctional Institute in Connecticut, a “supermax” prison. What is solitary confinement, and why do so many consider it to be torture? In a 2011 interim report by the UN Special Rapporteur on Torture, Juan Mendez, the practice is traced back to the early nineteenth century in the USA, where it was used as a progressive alternative to capital punishment. Its use soon spread. In the UK, with the largest prisoner population in Western Europe, 40 prisoners are currently held in such conditions. In the US, with the largest prisoner population in the world, there are over 80,000 prisoners in solitary confinement at any one time. Speaking earlier this month at King’s College London at the UK premiere of documentary film “Worst of the Worst” about the Connecticut prison in which Ahmad and Ahsan are held, during the first UK visit by Solitary Watch, investigative journalist and campaigner James Ridgeway stated that it is prison wardens who determine when people are placed in solitary confinement. Prisoners cannot appeal, as appeals are made to the same wardens and guards who apply the sanction in the first place. It is routinely used to punish non-violent offences. Juan Mendez has proposed a ban on the use of prolonged solitary confinement, set at any period of time over 15 consecutive days, the use of which has continued to expand “especially in the context of the “war on terror” and “threats to national security.” Ridgeway reported that in the US vulnerable groups were particularly susceptible: those with mental illnesses, LGBT prisoners, non-English speakers, Muslims and those with alternative political views. For both children and adults subject to the practice, it often involves a lack of human contact for days and weeks on end, lack of exposure to sunlight, exercising alone, with meals delivered through slots in solid steel doors and spending the rest of your time alone in a small, cramped space. In addition to other punitive measures such as being deprived of phone calls to family, humiliating physical searches and other abuses, given the current “lockdown” at Guantánamo Bay, conditions in US Federal prisons sound surprisingly similar. The psychological pressures and effects are enormous. Although prisoners held in solitary confinement account for 5% of the prisoner population, they account for 50% of suicides. In the film shown at the meeting, former prisoners interviewed report suffering hallucinations, hearing voices and later PTSD. Self-mutilation is common among prisoners, with reports of individuals biting off veins, testicles and other body parts. In a report last month, Physicians for Human Rights discuss the psychological effects of solitary confinement. For national security prisoners, such as Ahmad and Ahsan, “solitary confinement then becomes entirely punitive, with dire consequences for their mental and physical health. […] national security detainees are particularly likely to be held in isolation for prolonged periods because their precarious legal status makes them less able to challenge their conditions of confinement, including placement in isolation.” The “severe and lasting physiological and psychological harm” can also amount to cruel, inhuman and degrading treatment, and torture. An individual such as Talha Ahsan is all the more susceptible in view of the fact that he suffers from Asperger’s Syndrome. As well as the longer-term damage and isolation faced, the secrecy, invisibility and non-transparency surrounding the issue make it harder to deal with. In another analogy with Guantánamo Bay, Ridgeway described the conditions at supermax prisons as having the “makings of a rendition programme”, with respect to secrecy about conditions in them and those affected. At one such facility which has attracted greater public awareness, Pelican Bay in California, one prisoner has recently notched up his 40th year in solitary confinement. Awareness is growing about the issue. 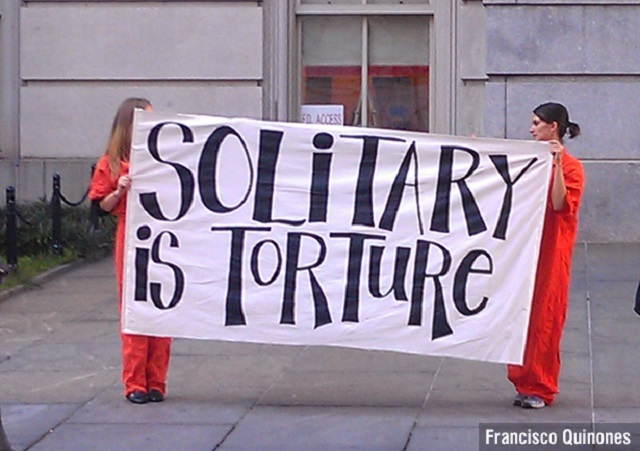 In a briefing before the Inter-American Commission on Human Rights in March, Juan Mendez called for stronger regulations on the use of solitary confinement, which “should only be applied as a last resort measure in which its length must be as short as possible.” In January, successful campaigning by Solitary Watch and other local organisations helped to close a supermax prison in southern Illinois, Tamms. Hunger strikes organised by prisoners in protest, in spite of the extraordinary conditions of their incarceration, have also raised awareness, as have lawsuits against the inhumane conditions. Solitary confinement is not just a US issue, particularly its use under the guise of national security concerns and the “war on terror”. For many, the damage is already done. Speaking at the meeting, Hamja Ahsan, brother of Talha Ahsan, reported that he had learned the previous day, 15 May, that the trial of Ahmad and Ahsan, scheduled to take place in late 2013, had been set back to March 2014. He stated that nonetheless “irreversible psychological damage will be done in one year and five months”; this being before the case is even brought to trial and without conviction. A number of supermax prisons in the U.S. place young offenders in solitary for minor infractions of the rules. A Guardian article “Kids in solitary confinement: America’s official child abuse” cites the example of 16 year-old named Molly who was placed in solitary for 22 hours a day for several months. Half of prison suicides and self-mutilation occur in these conditions.